I had never been to the Park before my hike. From books and the internet I tried to gather some information. One frustrating problem was that I could not find maps that matched. Every map was different. I was not expecting much from 164 acres. Directions: From Gallatin, TN take Hwy 25 east for 5.30 miles to Zieglers Fort Rd. Turn right onto Zieglers and head south 1.40 miles. The Park is on the left. Entering the Park, the Office is on the right. Just beyond the Office is a kiosk sponsored by the Friends group. There is a wealth of information about the Park on the bulletin board and also available in pamphlets. There is limited parking near the Park Office. 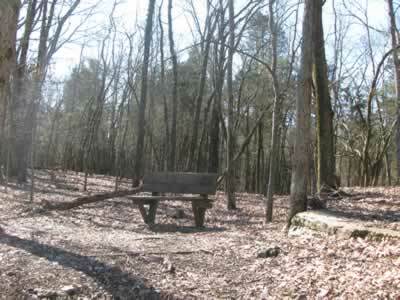 More parking is available by continuing for .25 miles and then turn right to the picnic area on Raccoon Creek Lane. 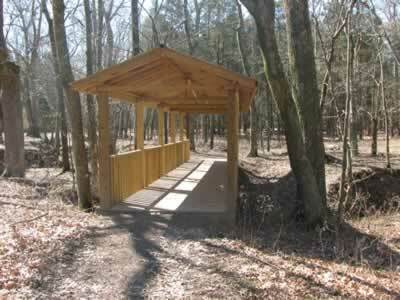 The Wildlife Observation Deck is near the picnic area. 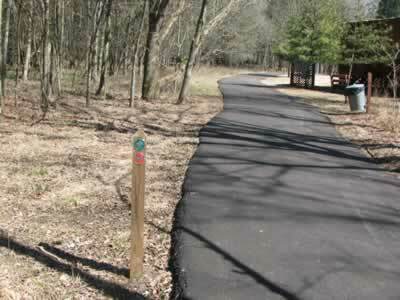 The Loop Trail is the unofficial name for the circuit which uses parts of all of the Parks’ trails. 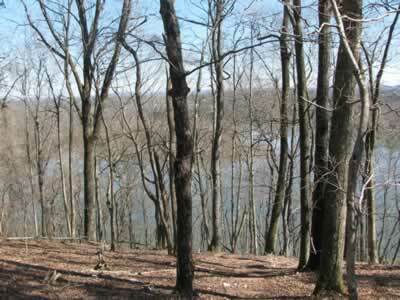 The Shoreline, High Ridge, Big Oak, and Birdsong trails are all used to make the Loop. Basically the trail follows close to the Park’s boundary. From the Observation Deck go left to start the hike. The first segment of the trail is on the red blazed, Shoreline Trail. 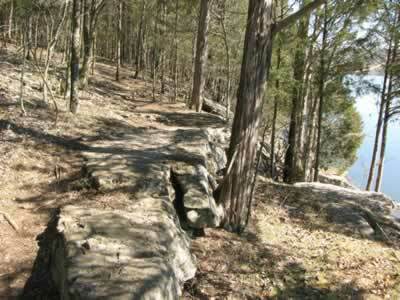 The easy hiking along the lake makes this trail essential for all of the campers. 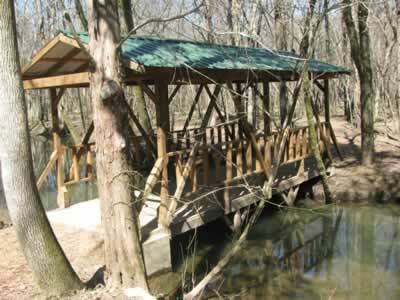 It easily connects the campground with the rest of the Park. 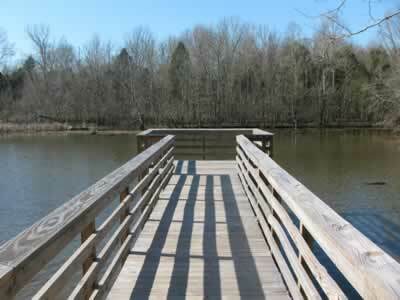 The trail follows the lake for a short while before it moves away to a bridge crossing a small creek. Returning to the shore the trail soon enters a clearing at a power line crossing. 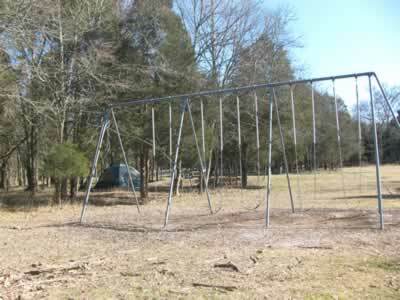 A playground is a few hundred feet away in the campground. 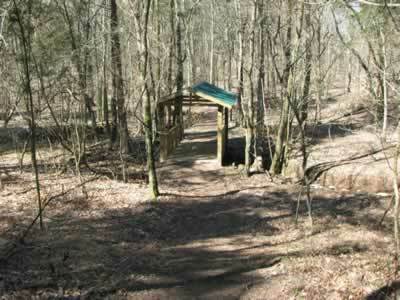 Continuing, at .30 miles, from the start, the trail reaches a dock for the campers. 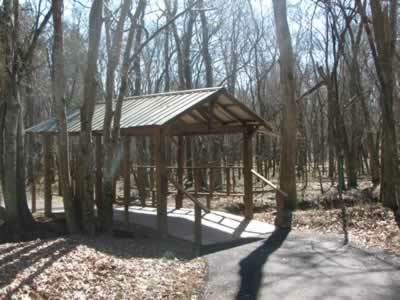 The Maintenance Building is also in the same area, located at the end of Deer Run Road. In .20 miles the trail turns the corner and heads more to the north. 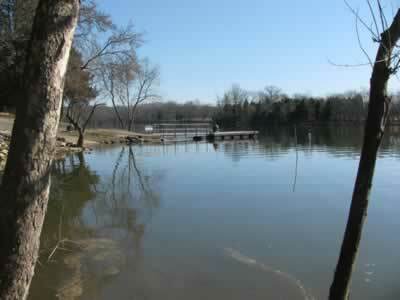 At this point the lake leaves the tributary and joins the main body of Bledsoe Creek. 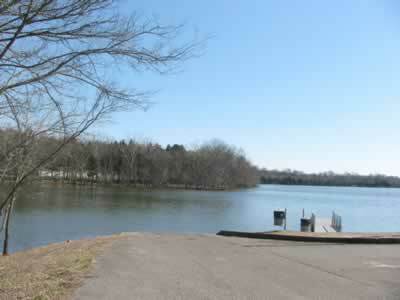 It is another .20 miles to the Camper's Boat Ramp and dock. The ramp is at the end of the Bledsoe Park Road. To return by road, it is .35 miles to Raccoon Creek Lane and .10 miles on that lane to the parking. From the parking area there are two trails which leave the north side. One is by the lake and the other is a hundred feet to the left at a "trailhead" sign. The trails intersect and are about the same length. One map I have shows the High Ridge Trail starting at this point. Another map shows the Shoreline Trail continuing. If it is the High Ridge Trail, it is following the shoreline! 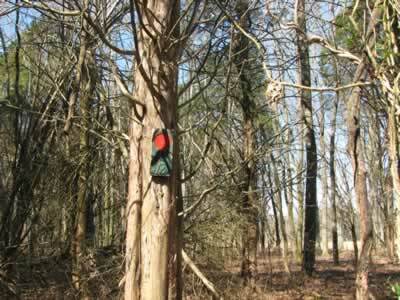 The High Ridge Trail (also) uses red blazes. Along the shore the trail passes an old homestead and old road. After .50 miles the trail turns left and starts the climb. It is only a little over 100 feet; but it is steep. At the top of the steps a bench awaits. There are good views from this point in the winter. After a couple of hundred feet of hiking on top of the ridge, the trail descends, crosses a drainage, and ascends to the top of the other side of the drainage. A bench is once again at the top of the climb. To the right a stone fence marks the boundary. Glimpses of the fence are seen for the rest of the time the trail stays high on the ridge. It is .40 miles from the start of the first climb to the fence corner and .10 miles further to the junction with the Blue Trail. The Blue Trail descends the hill to the Bledsoe Park Road. It is a little over .20 miles to the road as it is .45 miles to the road and back to the High Ridge Trail. The trail joins the road between Woodchuck Hollow Rd and Rabbit Jump Hill Rd. 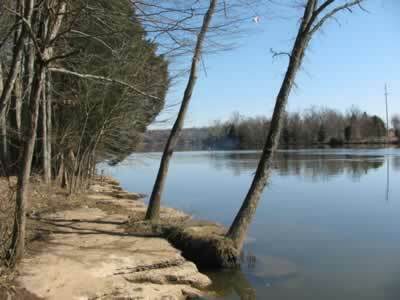 By road it is .20 miles to the boat ramp and .25 miles to the Park Office. Back on the High Ridge Trail the trail gradually descends into a ravine. 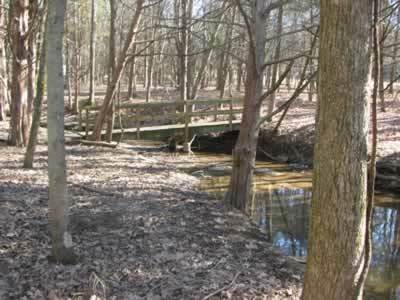 A bridge is crossed at .25 miles from the Blue Trail Junction. Climbing again the trail junctions with the first of two Red Side Trails in another .15 miles. 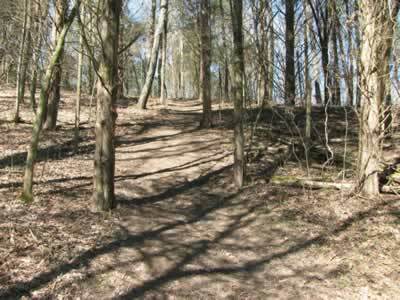 The two Red Side Trails both go down the hill to intersect with the Bledsoe Park Road near the Park Office. The trails are .05 miles (a couple of hundred feet) apart on the High Ridge Trail. Each leg of the Red Side Trail is .10 miles. 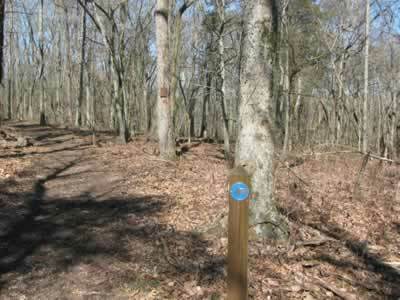 After the second Red Side Trail, the High Ridge Trail changes to the Big Oak Trail, which is also blazed red. Two of my sources show the trail changing names even earlier - at the junction of the Blue Trail. The Trail makes a natural break at the Red Side Trails, and it seemed like a good location to change trail names. 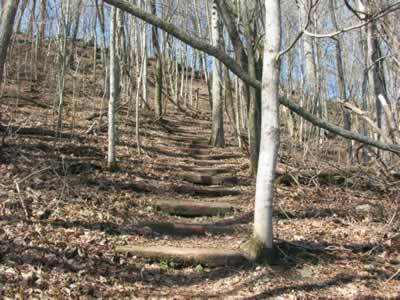 Regardless of the name of the trail, to hike the Loop, continue straight at the Red Side Trails. Descend into another drainage, cross a bridge and continue to the Park Road. It is .25 miles from the top of the hill (second Red Side Trail) to the road. Use care crossing the road (there are no crossing signs warning motorist.) At the road the Loop Trail begins the Birdsong Trail segment. The Birdsong Trails are blazed green. It is a couple hundred feet to a junction. 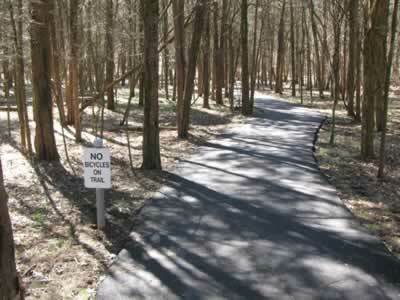 The paved path to the left (blazed green) makes part of the Birdsong Trail, but is not part of the Loop. Taking the turn it is .10 miles to a bridge (the same stream as the last bridge crossed.) Continuing the path intersects another path in .10 miles. From this four way intersection there are three choices from this point. Left leads uphill a short distance to the Park Office and Friends Group Kiosk. 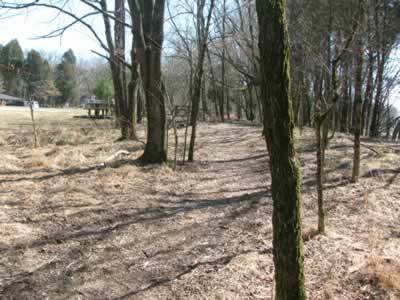 The second choice is turning right, which leads to the northwest corner of the ball fields, stage, and continuing back to where the path began in .20 miles (see the map on Page 2.) The Birdsong is a .40 miles paved loop. Choice three continues straight on the path. 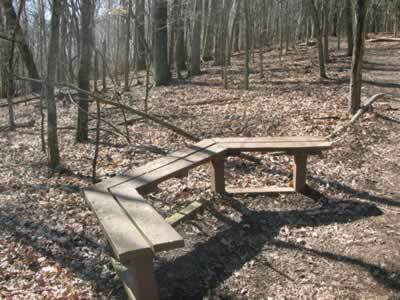 It leads to Raccoon Creek Lane picnicking and parking in .10 miles. Shortly after the bridge a trail leads to the right. This red blazed trail leads to the Public Launch Ramp. The trail offers good views of the Shoreline section of the trail. It is .30 miles to the ramp, .60 miles round trip. 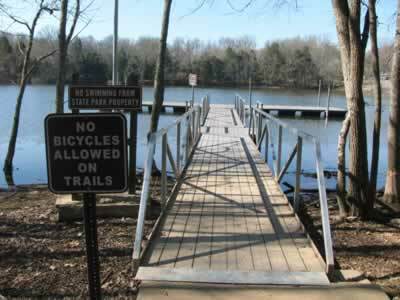 From the junction with the trail leading to the boat ramp, it is .05 miles to the southwest corner of the ball fields and stage. Going straight leads to the four way path intersection and then to the Park Office. 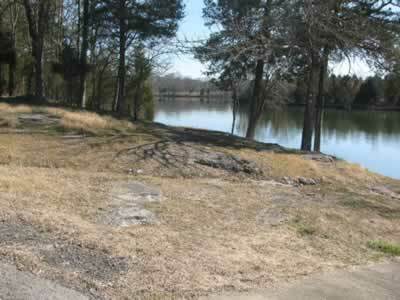 Turning right, the trail follows a narrow path between the ball fields and lake. A red arrow directs the last turn. It is .10 miles to return to the Observation Deck. 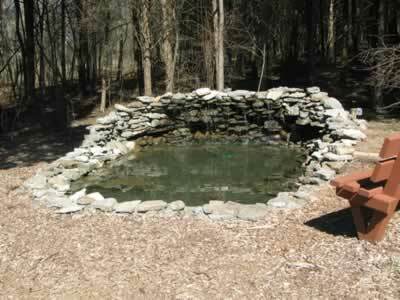 The Loop Trail, without any side trips, is 2.70 miles. Adding ‘out and backs’ of all of the side trips adds another 1.80 miles.